Like most any club, association or society, eBay requires its members to follow a set of standards created to maintain some degree of order and harmony within its ever-expanding e-commerce culture. eBay's rules and policies are broad, and not always completely clear at first blush. Before getting started buying or selling on eBay, everyone should thoroughly read the User Agreement, which comprises the terms and conditions of your membership with eBay. For a deeper dive into some of the topics, eBay provides online tutorials dealing with "trust and safety" subjects like general marketplace rules, fee circumvention, leaving feedback, and avoiding intellectual property violations. Still have questions? Go to the Answer Center, an eBay discussion board on which members can get advice from other members about anything concerning eBay. Prohibited items generally include anything that is illegal, stolen, hazardous or offensive. Illegal and stolen are fairly straightforward. But what constitutes hazardous? Just about anything that's flammable, explosive, radioactive or toxic. If you can't take it on an airplane or ship it via U.S. Mail or commercial carrier, it's not going to fly on eBay either. What is and isn't offensive is often in the eye of the beholder, but eBay defines this as items that glorify hatred, violence or racial or religious intolerance; or promote groups that support such views. Restricted items are things that are allowed only under specific circumstances or by approved sellers. Event tickets, for example, can be resold as long as the resale doesn't violate any laws or terms of the ticket itself. And if those tickets happen to be for a charity event, the seller has to also donate at least 20 percent of the sale price to the organizers. Items that are regulated under federal law like food and certain approved medical devices are also allowedas long as the seller is licensed or stays within government guidelines. Other categories such as travel have stringent limitations on who can sell what. Listing-practices violations range from improper use of language to unauthorized use of technology to enhance or promote your listing. Profanity is strictly prohibited, unless it's part of a book or movie title, for example. In this case, the naughty word can only be spelled out using the first letter followed by asterisks. Writing listing titles or descriptions that are misleading or misrepresent your items is also against the rules. A variation on this, which is more common than eBay would like, is keyword spamming. This happens when sellers insert an unrelated term, like a brand or manufacturer's name, in the listing title to get the item to show up in more searches. A listing title reading "MP3 player, not iPod" would be considered keyword spamming because the seller is piggybacking on the popularity of iPod brand music players to get his or her listing noticed, even though the item has nothing to do with an iPod. 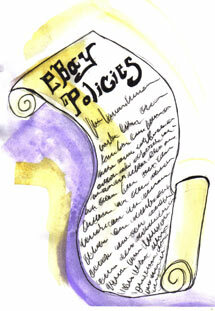 It's also against the rules to provide Web links on your listing page to sites outside of eBay. It's natural to want to promote your online business or bricks-and-mortar store as you sell on eBay. And eBay provides a place to do this for freethe About Me page. The best approach is to invite viewers of your auction to click the icon next to your user ID. There, you can provide up to three links to your off-eBay business or whatever sites you wish to promote. Listings can't use techniques to avoid or circumvent eBay's fee structure. For example, it's a breach of policy to offer to sell items outside of eBay, or even to list catalogs that do so. Charging an extra fee to use a credit card or PayPal is also strictly forbidden, as is listing with a very low Buy It Now price to keep insertion fees low and inflating shipping fees to cover lost profits. Some common transaction-related violations include refusing to accept PayPal as a payment method even though your listing included a PayPal logo, and shill bidding. Shill bidding is entering fake bids from another account to inflate the bid price on an item. If you get caught in the act of violating eBay's rules and policeseven if the infraction was unintentionalthe consequences can be anything from a slap on the wrist to permanent exile. The first thing that will happen is eBay will email you and anyone who bid on your item to say that the listing has ended. Then eBay will dole out punishment. Depending on the severity of the violation and whether you have been found on the wrong side of eBay's rules and policies before, the sentence might include having to pay insertion fees for the canceled listing, temporary limits on what or how much you can sell, loss of Power Seller status, account suspension or even getting completely kicked off of eBay. It's not pretty in any case. Having your listings canceled leaves a bad impression with buyers, who may avoid your listings in the future or leave you negative feedback for future bidders to see. Even if you win a reprieve from eBay, the damage is done. The best approach is to know and understand the rules and policies, and abide by them out of respect for other eBay users. It's the only way to ensure a fair and safe trading environment. Auctiva Editor - Call them. I find it is easier to call or do a live chat when I'm frustrated. You can ask questions and get answers in your time frame and nothing is pat like a well read letter. I am so upset with eBay that I am seriously considering moving my business. I sell used clothing and they decided I cannot sell a used Chanel blouse starting for under $40 because I have sold too many designer clothes lately?!? I have 500 plus postive feedback (100%) top 10% DSRs, and I am just FURIOUS! They won't even give me a good reason why I can't sell it, nor can I find it anywhere in the rules why I can't. It's way too crazy. I have sold a LV, and two chanels and a dior before in my whole history, and got positive feedback on eash. WTH??? eBay merchant is the first in U.K. to face charges for phony bids. Checks and money orders will no longer be accepted on eBay. eBay withdraws ban on links to external sites. eBay sellers lose ability to 'neg' bad buyers. eBay sellers required to state domestic shipping price in listings.